It was the day of the big game and everyone was happy. Just a week ago the boys on each team had wondered what they were going to do until the game. Some of the boys had gone swimming to take their minds off of the game but the other boys were worried that they wouldn’t be able to hit the ball. The day came. It was a hot Saturday in August. A lot of people had come to see the game. It was the Braves against the Tigers. The Tigers were the best team in the league. The Braves were the worst. Everyone thought the Tigers had already won the game. The coin was tossed and the Braves decided to bat last. The first two innings were scoreless but in the third inning the Braves took the lead, three to nothing. The next inning had the bases loaded with two outs. A boy who always struck out was up. The pitcher pitched the ball and the boy hit a grand slam. Then the Tigers scored twice and the score was seven to two. Then the Braves scored six times and won the game thirteen to two. The end. 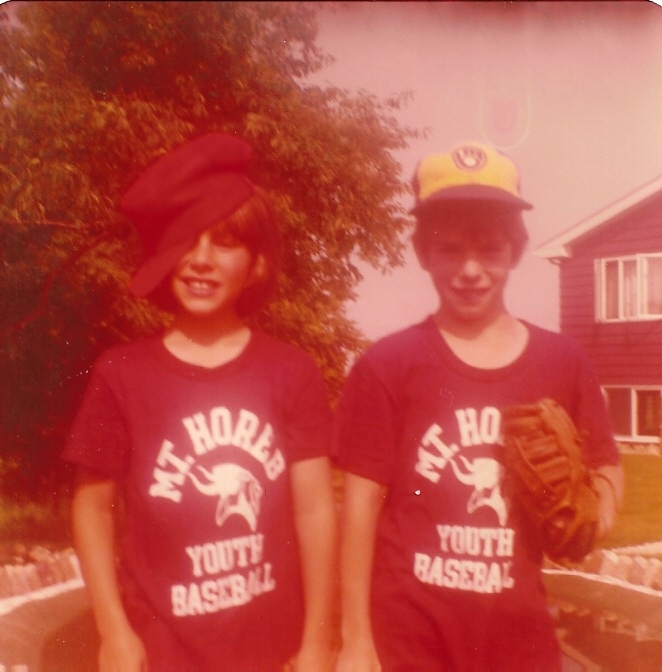 My childhood friend Devin is on the left and I’m on the right – ready for T-ball. One (or both of us) could always be found goofing off in photos!